Jordan Peterson is an interesting character. A Canadian clinical psychologist and professor of psychology at the University of Toronto, he has had a meteoric rise in popularity in the media as of late. One reason for Jordan Peterson’s recent popularity is that he has been able to put words and justification to what many people consider “common sense”, not least of all when it comes to the idea that gender is not a social construct, but is rooted in biology. He then, as a psychologist, gets into the psychology behind this very relevant social issue. I recently finished reading his book, 12 Rules for Life: An Antidote to Chaos, in which he brings some of his training and experience and makes it very practical, from everything to posture, raising children, and conversation. Jordan Peterson states emphatically that he is not an atheist (nor does he believe that anyone is actually truly an atheist). He is also not a Christian, at least not in the traditional sense. He mentions in the book that he received a Christian upbringing, but departed from Christianity once he got out on his own. Nevertheless, Peterson champions many things which are considered biblical or Judeo-Christian values. He argues convincingly for the doctrine of human depravity, and often uses the word “sin” – a word which even many Christian churches today try to avoid, as they feel it is off-putting and rubs people the wrong way. Jordan Peterson does not shy away from talking about human depravity and the need to take personal responsibility for your actions and decisions. Peterson quotes generously from the Bible in his book; in fact, I mentioned to someone the other day that Peterson talks about and quotes the Bible more than the authors of many explicitly Christian books I have read! However, Jordan doesn’t only quote from the Bible, he also attempts to exegete and interpret the Bible, particularly the opening chapters of the Book of Genesis, and it is here where I, as a theologian, take issue with what he says. Anyone who attempts to interpret the Bible will inevitably be influenced in their interpretation by their presuppositions, their commitments to already-held beliefs. None of us are truly objective. We all look at things through various lenses, and those lenses invariably and inevitably affect the conclusions we reach. As a humanist who buys into the idea that all religions developed as the result of the shared consciousness of particular cultures, Jordan Peterson views the Bible as being a didactic mythology which served to help certain groups of people at certain times. He does not believe that it is objectively true, or even more true than the sacred writings of other religions, rather that it reflects the collective consciousness of a particular group of people at a particular time. Thus, rather than taking what the Bible says at face value, he tries to fit it into his own framework of thinking. The reason this is sometimes confusing, is that it is unclear where exactly Jordan Peterson’s worldview comes from. It seems to be influenced by the Bible in large degree, and yet Peterson clearly has other influences, particularly Enlightenment thinkers, who championed the above stated views on the Bible in particular and epistemology in general. Here’s the irony: while Jordan Peterson (rightly) argues against relativistic approaches to things like understanding gender and hierarchy, he himself has a relativistic approach to epistemology, truth and worldview! He has basically created it for himself, based on what he subjectively decides to borrow from various religions and philosophies. For example, Jordan Peterson states (as fact) Wellhausen’s “Documentary Hypothesis” about the construction of the Old Testament having had 4 main sources and several redactions. Wellhausen’s theory is now considered deeply flawed and is not held by many contemporary Bible scholars. It is irresponsible and misleading, in my opinion, for Peterson to state this as if it is accepted fact, without even giving the caveat that this is a theory from the 1800’s which a great number of Bible scholars today (who have studied this subject in much greater depth than he has) no longer accept. Furthermore, I would say that Jordan Peterson practices irresponsible and uninformed biblical exegesis and hermeneutics repeatedly throughout his book, particularly in regard to the significance of the opening chapters of Genesis. For example, in Rule 7: Pursue What is Meaningful (Not What is Expedient), he states that the Bible says that work is part of the curse of sin and death in Genesis 3. This is simply not the case! Genesis 1 & 2 show that work was part of the idyllic world which existed before sin came into the world, and it portrays God working. The difference after the curse, was not that people would have to work (they worked before the curse), but that their work would be characterized by frustration because of the introduction of sin and imperfection into the world. Another example can be found in his further attempts to exegete and interpret Genesis 3:22-24, where it says that God drove the man and woman out of the garden after they fell into sin, lest they eat of the Tree of Life and live forever. Peterson expresses that this action of God seems mean and inexplicable. There is a very good and widely held view on why God did this, based on a clear reading of the text: God – in His mercy! – did not want the man and woman to be cursed to an eternal existence in their fallen state. Rather, he would allow them to die, so that he could then resurrect them once he had accomplished his plan of setting right all that they had done wrong. We call that: the gospel! In summary, Jordan Peterson speaks with such confidence and bravado that he comes across as an authority, when in actuality he is merely recycling old Enlightenment approaches to the Bible popularized in the 1800’s, which are not considered to be consensus today. My final critique of Jordan Peterson’s book would be this: he concludes the book by telling people that they must be strong in the face of adversity. He says that life is pain and hardship, but we must be strong in the face of it and persevere. But here’s the problem: he never gives a reason WHY we must persevere! Why push on? Why try to be strong and suffer well? In other words: If we have no destination, and the journey is painful, then why bother continuing the journey? Having rejected the hope of the gospel, Jordan Peterson has sawed off the very branch he is standing on, and at the end of his book, his message to be strong and persevere falls flat because he has not shown us that life has an actual telos: a destination, meaning and purpose. As Christians, we absolutely do have a hope which goes beyond this life, and it is this hope which makes our lives meaningful and worth living, even in the face of hardship. We have a destination, and that destination gives us a mission in this life. Our goal is not only our own happiness, but to use our lives for God’s purposes until we do come into the great eschatological hope of eternal life because of what God has done for us in Jesus. What Happened That Made You Like This? 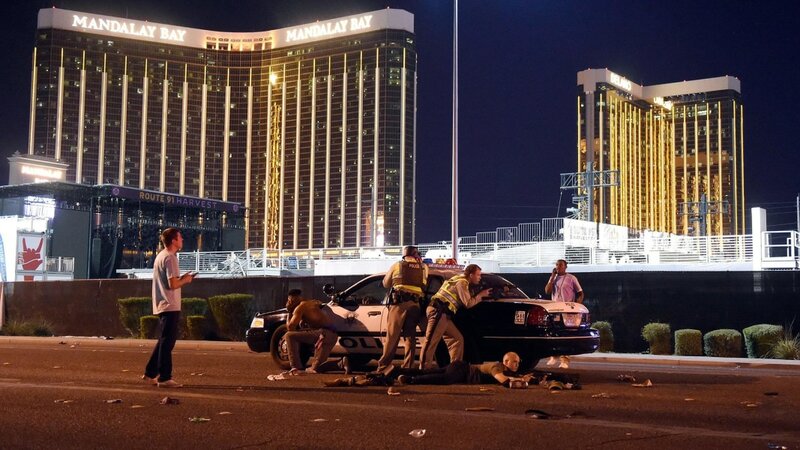 Since the shooting in Las Vegas last Sunday, authorities have been searching for a motive for why Steven Paddock opened fire on a crowd of people with the intent to kill as many as possible. So far, no leads have turned up. Everyone who knew him seems genuinely shocked. He doesn’t seem to fit any of the expected patterns or usual profiles. People are confused and asking: How does someone get to the point where they would do something so profoundly evil and terrible as this? You have a psychological complex because you were raised improperly. You did it because of bad sociology: you weren’t educated enough, or you were poor. It’s a result of bad genetics and/or you are aggressive because of millennia of natural selection which favored aggressive behavior. Officer Starling is the quentisential modern person. She thinks: “You are doing bad things, therefore something must have happened to you, something must have come from outside – it couldn’t have come from inside!” This is a philosophical leap of faith, which assumes that people are basically good, and if they do anything bad it is only because of outside influence. Hannibal Lecter is making a very important point: the modern worldview has no category for evil. The modern world view has actually been eroding very quickly. In the 20th Century, the world became wealthy and educated, many of the problems of poverty were overcome, and yet wars and violence didn’t end, they escalated. The 20th Century was the most bloody century in history – at a time when the world was more educated, industrialized and wealthy than ever before. The Christian worldview, however, which is based on the Bible, has no problem accepting these things – because we have a very comprehensive view on sin. We have a category for Hannibal Lecter and for Steven Paddock. The Bible tells us that within all of us lurks the capacity for terrible acts, because we are fallen and corrupt. The theological term is: Totally Depravity. That means that, apart from God’s work within us, even the good things we do, we do for less-than-pure motives: either to benefit ourselves, bring praise to ourselves, or to justify ourselves. We should pursue better legislation, further education and the eradication of poverty, because we have been given a calling and vocation from God to “subdue the Earth,” i.e. to manage it well and to do all that we can under God to promote human flourishing. But we must remember that such things do not change the heart. We must place our ultimate hope in the redeeming work of Jesus Christ on our behalf.